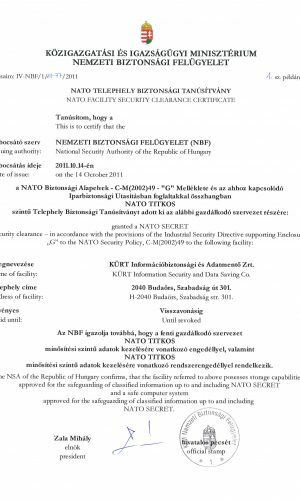 It certifies that KÜRT Információbiztonsági és Adatmentő Zrt’s site is of NATO SECRET security level and the company has a licensed and a system license for handling NATO SECRET information, in accordance with provisions contained in Annex C-M(2002)49 of the NATO Security Principles and the related Industrial Safety Instructions. It certifies that KÜRT Zrt’s site is of TOP SECRET security level and the company has a licensed and a system license for handling TOP SECRET information, in line with provisions contained in Article 16 of Act CLV of 2009 on the protection of classified information and Article 6 of Government Decree 92/2012 (III.31) on detailed rules related to industrial security control and issuing site security certificates. 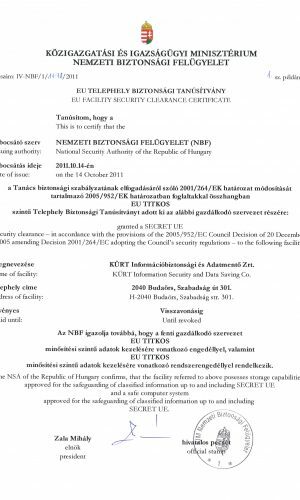 It certifies that KÜRT Zrt’s site is of EU SECRET security level and the company has a licensed and a system license for handling EU SECRET information, in line with provisions contained in Council Decision 2005/952/EC of 20 December 2005 amending Decision 2001/264/EC adopting the Council’s security regulations.